Looking for something different this year for your Thanksgiving dessert? Or have a vegan friend who really loves pumpkin spice flavors? Try this vegan pumpkin tofu cheesecake. It's quick to prepare—just blend a few simple ingredients together and bake—and guaranteed to impress your guests. Some vegan cheesecake recipes rely on tofu and others on a dairy-free cream cheese substitute. This easy and homemade pumpkin cheesecake recipe uses a bit of both, along with canned pumpkin, sugar, and plenty of aromatic and savory fall spices, including ginger, nutmeg and cinnamon. For the crust, you can use a homemade vegan graham cracker crust, or for something a little different and extra crunchy, try this easy vegan granola pie crust recipe. In a food processor, combine the silken tofu, vegan cream cheese, canned pumpkin, sugar, flour, ginger, nutmeg, cinnamon, salt and baking soda and process until smooth and creamy. You will probably need to stop and scrape the sides several times to get everything incorporated well. Make sure there are no chunks of tofu or vegan cream cheese remaining at all. The batter will be thick and creamy. Taste it, and adjust seasonings to taste, if you'd like. 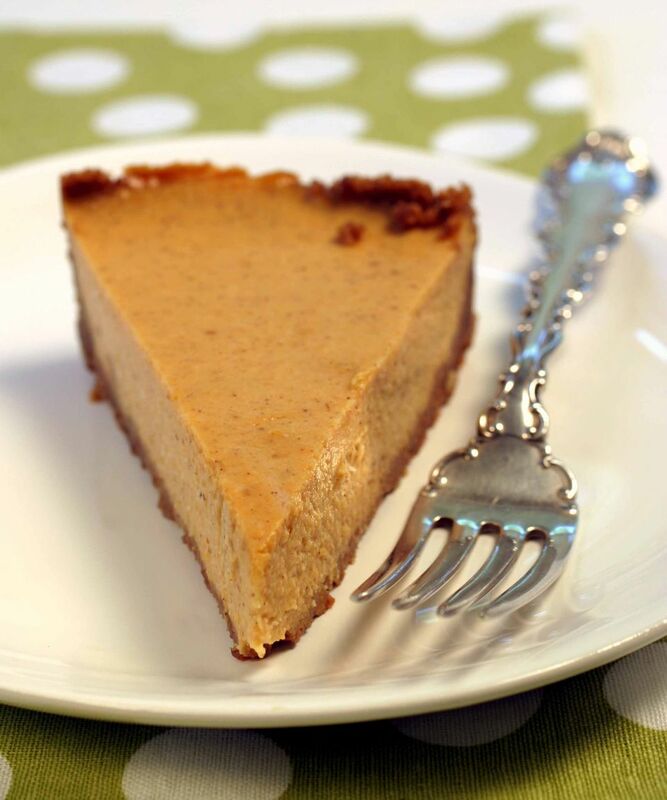 Pour the cheesecake batter into the prepared vegan pie crust and bake for 45 to 50 minutes. After you remove it from the oven, allow your pumpkin cheesecake to cool slightly, then refrigerate. Your pumpkin cheesecake will set more upon chilling, so don't worry if it looks a little wobbly when you remove it from the oven. If your cheesecake seems a bit soft and you are worried about slicing into it, you can stick it in the freezer for about 10 to 20 minutes before serving, just to make slicing a little easier.